Daring Digits is having a GIVEAWAY that is ending in just over an hour!!! Enter HERE!! It's totally my fault! I should have told you guys sooner. I'm so sorry!!!! Here are the polishes that were named after her company, which just celebrated it's first year of business!! Yay for Ashley!! A huge congrats!!!! This is Digits! For this mani, I used 2 coats and Wicked Fast top coat by Cult Nails. Love all the rainbow of colors. This is a nice white jelly base! This is Daring! I love it because it kind of plays on the dark side, that is Daring...get it? haha ok, cheesy :-) But this is gorgeous! For this mani, I used 3 coats along with Wicked Fast top coat by Cult Nails. The black jelly base shows off the layers of glitter!! So pretty! Since these are jelly polishes, I decided to try layering! This is Sinful Orange Cream with 2 coats. I then placed 1 coat of Daring and Digits on every other finger, topped with Clearly On Top by KBShimmer. I love Digits over this!!! Lighter colors are going to look awesome with this white base, while darker colors will look better with the black jelly. That makes these very versatile. This is ManGlaze Fuggen Ugly, 1 coat and a matte polish. Again, I used 1 coat every other nail of Daring and Digits, topped with Clearly On Top by KBShimmer. This time I think Daring is better for the darker base!!! Both of these are gorgeous mixes!! Ashley did have a bit of complaints on a smell of her polish. You can read more about it HERE. I didn't notice the white bases, but some of the others I received were stronger. I honestly smell polish so much, I am used to it. That might be kind of scary...LOL :-) Anyway, I think Ashley is fantastic when it comes to customer service. She is always sweet and there to help. She always strives to meet customer satisfaction. She is also very creative and has a lot of different types of polishes to buy!! I definitely recommend checking her out. Close up! Isn't that gorgeous!? Again, you can find Daring Digits polishes at http://www.ddpolish.com/. 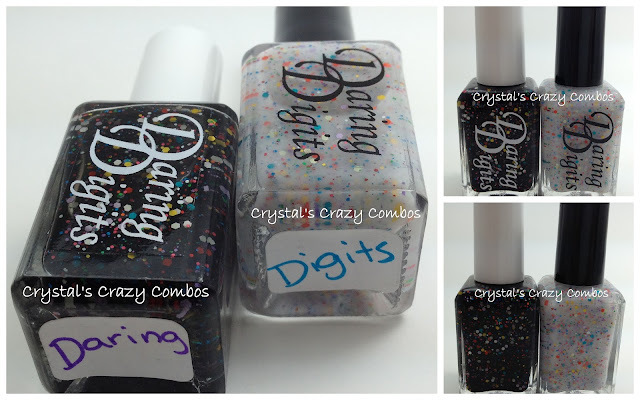 For more info and to stay up to date, follow Ashley on Instagram - @daringdigits, blog - http://www.daringdigits.blogspot.com/, and Facebook. I hope you have a fantastic day tomorrow! !